I’ve REALLY tried to cut back on shopping over the past year. When your closet gets out of control like mine has, you start focusing more on absolute essentials (most clothes/shoes/accessories don’t fit in this category) and less on everything that catches your eye. And I have to say, I’ve been pretty successful. That is, until I went shopping with my mom a few months back. 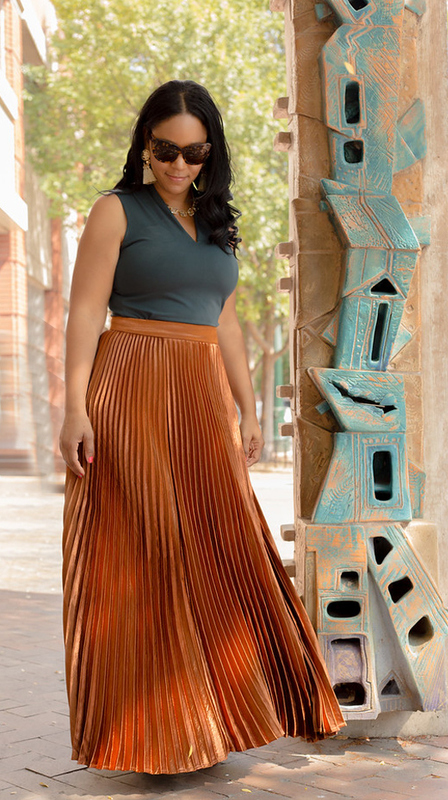 I spotted this skirt peeking out from a rack and the gorgeous, vibrant metallic copper color commanded my attention. I tried it on for my mom, thinking she’d totally talk me out of buying it and instead she told me to get it! 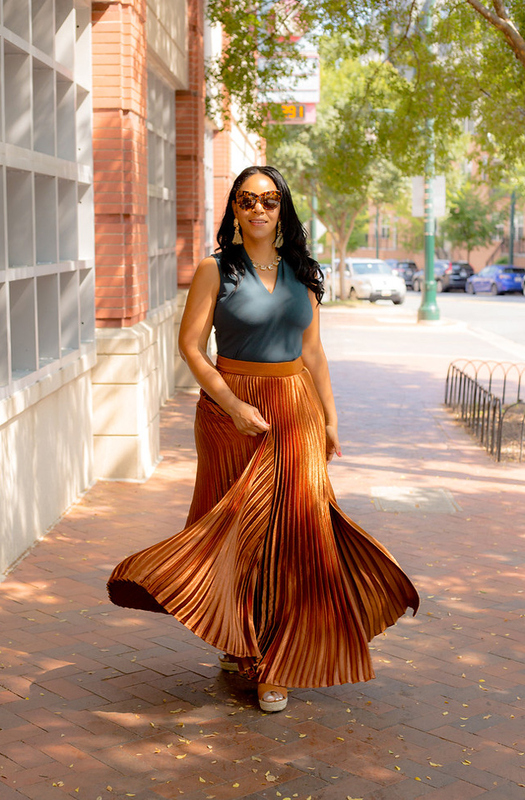 “Where would I even wear a copper metallic pleated maxi skirt?” I asked out loud. Her reply? “You’ll find somewhere to wear it. Maybe to a holiday party.” Welp – when your mom encourages your shopping habit… That was all the gentle encouragement I needed to buy it! I’m glad she did, though. 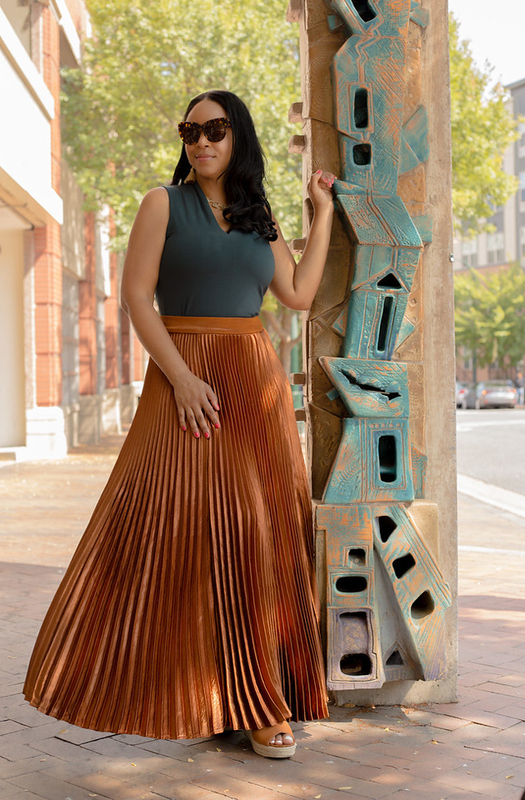 I adore the skirt. It’s one of those beautiful pieces that you stare at and hope an occasion will materialize so you have an excuse to wear it. Or, you’ll do like I did and just put it on for a casual stroll around town. Anyway, it DOES make the perfect party skirt, doesn’t it? Right now, I’d pair it with a black off-the-shoulder knit top and some heeled boots for a holiday party (well, one that’s not ugly Christmas sweater-themed anyway). How would you rock it?